Athletics and our 400+ student-athletes. I am so very humbled to serve as your Director of Athletics. In the past five years, together, we have accomplished great things, and 2017 was no exception. Last year I called upon you, our Huskies, to UN1TE by coming together to support the future and help NIU student-athletes strive for excellence. You did just that! In April, at our second annual Victor E. Ball, we launched the Campaign To Sustain initiative in support of the most essential part of our athletic department - our student-athletes. You proudly stepped up to support this initiative and this past November, during Huskies Invest: A Week of Giving, you surpassed our initial goal of $100,000 by generously giving $115,667 through 175 gifts over a week’s time. Your continued support will allow your student-athletes and your programs to grow, advance, and carry on the proud tradition of NIU Athletics. Whether supporting Campaign To Sustain, renewing or becoming a season ticket member, giving to sport-specific initiatives, or simply filling the stands and cheering on your Huskies, YOU MAKE A DIFFERENCE. 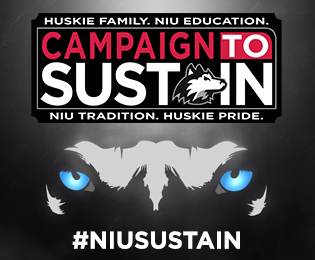 I am excited for the future and look forward to the success of the Campaign To Sustain as together we provide the very best for generations of Huskie student-athletes.